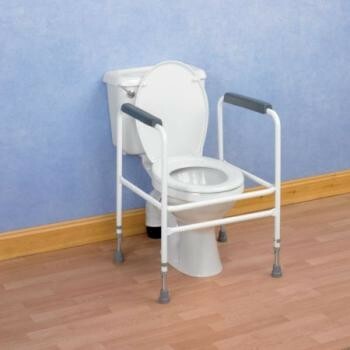 Height adjustable, epoxy coated, steel toilet frame with padded arm rests for comfort and support. Adjustable Toilet Surround...Height adjustable, epoxy coated, steel toilet frame with padded arm rests for comfort and support. Maximum User Weight: 191/2 Stone (125kg). Rail height 635 to 788mm (25 to 31").